The weeds were gone this morning due to the windshift we experienced yesterday and today and guess what - the pompano bit. I rescheduled my charter this morning due to the predicted uncertain surf conditions and as usually happens, the swell was gone. I ran down to the Bridge Road beach access in Hobe Sound to check that area and was happy to find the pompano there. I started fishing around 8 am and was limited out and releasing pompano by 9:15. The day started with a remora and two bluefish before the pompano turned on. Once they started biting it was non stop action on EZ Flea Fishbites. After getting my recrerational limit of 6, I left one rod in the sandspike as I started putting my gear away and that rod produced numbers 7,8, and 9 which were then released before I was able to take it out of play. I talked to a friend who was fishing south of me and the bite was as productive there as well. This is the kind of fishing we should have for the next few weeks so get out when you can. I stopped at the Snook Nook on the way home and local river expert and Snook Nook staff member Woody told me of a great whiting and croaker bite at Walton Rocks Beach access. Great Spring weather and lots of action should be on tap this week. Fish the second trough, 70 - 90 yards off the beach for pompano and look at the near shore trough area for the whiting and croaker. 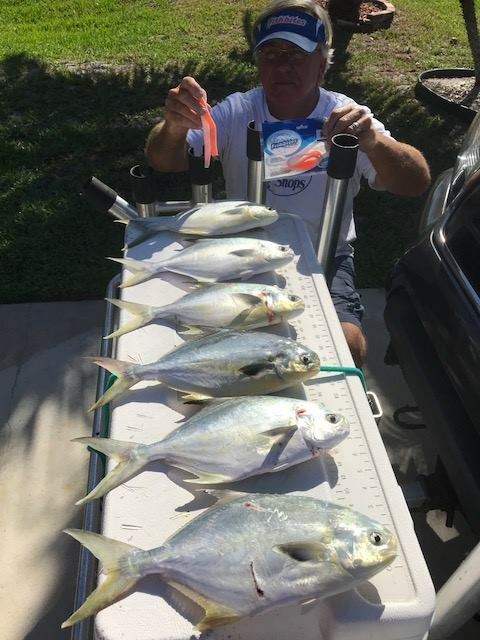 Fishbites, Clam Strips, and sand fleas will be the baits of choice for the pompano with Orange Clam Fishbites and cut shrimp the preferred offerings for the whiting and croaker. Good luck and catch em up.